In the recent 2016 SME Development Survey conducted by DP Information Group, the usual cost challenges faced by SMEs in Singapore in recent years continued to dominate concerns from the survey participants. Data from the 2,513 SME respondents polled indicates that rental, materials and manpower costs continue to be pertinent issues SMEs face in 2016. However, a key finding of concern is the increase of business loan financing costs cited by 22% of respondents, up from 6% in last year’s survey sample. 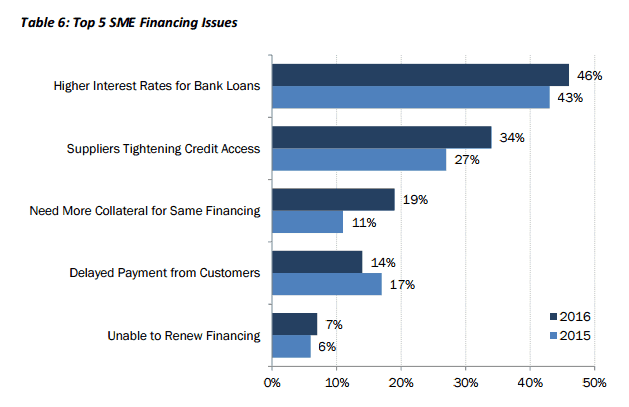 About half (46%) of SME respondents facing financing issues named higher business loan interest rates as their biggest problem when grappling with financing costs. 34% said their suppliers were tightening credit access and 19% mentioned they had to provide more collateral to maintain their existing bank facilities. Singapore’s economy has been facing strong headwinds in 2016 and growth has been tepid with most key business indicators and economists expressing pessimism throughout the year and further into 2017. Channel News Asia reported on 14th October 2016 that advance estimates from the Ministry of Trade & Industry shows Singapore’s economy expanded by a paltry 0.6% for 3rd quarter 2016 compared to the same period last year. This showing failed to meet the 1.7% growth forecast by private sector economists. Several senior government ministers have also publicly warned of the economic challenges faced by Singapore with Manpower Minister Lim Swee Say saying our “old model of growth was unsustainable”, Deputy Prime Minister Tharman Shanmugaratnam warning that “the Singapore economy is in for a tough period that will last for a while” and Prime Minister Lee Hsien Loong forewarning that “Singapore must prepare for economic slowdown”. Causes for the weakening economy involve external global events as well as domestic restructuring and policy changes. Singapore is an extremely trade reliant economy, with the highest trade to GDP ratio in the world averaging 400%. Recent external episodes such as Brexit, increasingly protectionist and populist stances in Europe and US as well as growth deceleration in China, Singapore’s largest trading partner all bodes negatively for Singapore’s external trade figures. Internal domestic issues such as government policy shifts in decreasing foreign manpower supply, tight local employment market resulting in escalating manpower costs as well as displacement of traditional industries by rapid technology disruptions has also resulted in further strains to local SMEs whom might find it challenging to even keep afloat in today’s environment. The economy is clearly stagnating for 2016 and likely throughout 2017. Estimates from the Ministry of Trade and Industry indicates Singapore’s economy to expand by only 1 to 2% in 2016, potentially the slowest year since the last financial crisis in 2009. In view of the weak general economy, it is no surprise that banks and financial institutions will take a more conservative view in credit underwriting. It is a given that SMEs are not as well capitalised as large corporates and MNCs and will find it even more taxing to tide through the protracted slowdown we are currently experiencing without access to financing at non-prohibitive costs. Data from MAS is already pointing out the corresponding slowdown in loans growth from banks with a Business Times article published on 31st August 2016 indicating drop in bank loans for 10 consecutive month as at July 2016. To put this date in perspective, the last time Singapore experienced similar extended loan decline was in the 1980s when total bank lending shrank for a consecutive 12 months. Expectedly, the decline in bank loans was largely attributed to lending to businesses. 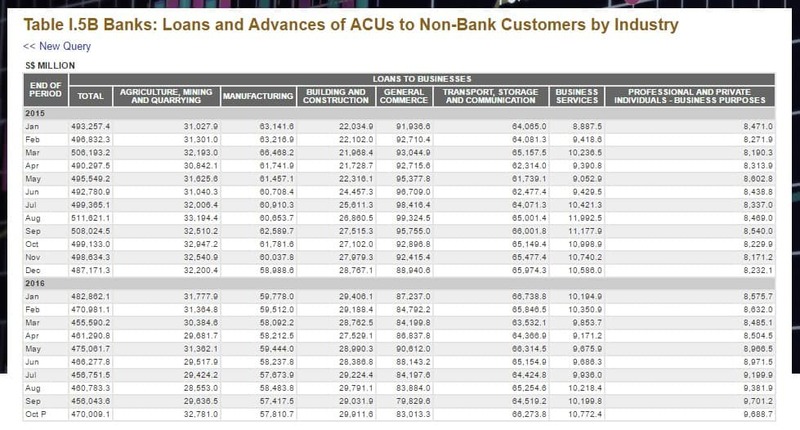 We have also done a research on MAS’s (Monetary Authority of Singapore) published statistics on total bank loans and advances to business excluding banking and financial services industries. From the below data, loans to businesses have continued to decline from January to October 2016 from corresponding months in 2015. For this 10 months’ period, loans to businesses declined on average to about 6.7% year on year. In the prior mentioned 2016 SME Development Survey, SMEs are also experiencing higher cost of financing in the form of higher interest rates demanded by banks and lenders. This is in line with the decline in bank loans to business as banks would have to price their capital accordingly with lower loan volume as well as heightened volatility in SMEs cash flow and possible increase in loans defaults. In an informal survey conducted by Linkflow Capital Pte Ltd, a SME financing consultancy firm, internal data of clients indicated an overall 9.5% drop in banks’ approval of unsecured business loan quantum (excluding secured loans with collateral) down from $21 million in 2015 to $19M in 2016. Approval percentage for business loans applications handled by Linkflow Capital on behalf of SME clients remains constant at 57% approval rate in 2016 versus 58% in 2015, measured across 307 business loan applications from 2015 to 2016. Approval percentage cited however is unlikely to be representative of the domestic lending sector as it only represents a small subset of all SME borrowers, derived from the firm’s internal data. Also, as specialists in SME financing, the firm will likely obtain higher approval percentage compared to the entire domestic SME market. Banks operating in Singapore typically do not publicly disclose their lending approval rates against SME loans applications received but it’s likely to be lower in 2016 compared to the immediate preceding years. Outside of quantitative statistics from internal data churned, Linkflow Capital does observe an increasingly tighter credit environment from most major banks and financial institutions in the SME lending sector for 2016. Banks will foreseeably continue to tighten credit underwriting through 2017 to protect asset quality if domestic and global economic conditions does not show signs of improvement. Costs of borrowing will likely creep upward if non-performing loans (NPL) ratios deteriorate further in 2017. 2nd quarter 2016 results from DBS and OCBC both reported increase in NPL ratio to 1.1% inching up from 1.0% in the preceding quarter. The 3rd local bank UOB held NPL steady at 1.4%. Financial markets are still sloshed with excess liquidity from central banks’ monetary quantitative easing exercises following the last financial crisis in 2008. Global interest rates remain depressed since 2008 due to the credit liquidity but rates are forecasted to gradually increase as economists expect the US Federal Reserve to announce rates hikes in December 2016 following several positive US trade and jobs growth indicators. Singapore’s benchmark reference lending rate Sibor (Singapore Interbank Lending Rate) moves in close tandem with US lending rates and is also expected to increase following any moves from the Fed on rates hike. This double whammy of tougher access to bank financing as well as higher interest costs could potentially tighten the noose around the SME which is not sufficiently capitalized. Cash flow is the life line of all businesses and access to credit facilities not priced at a premium is vital for today’s SME to tide through the downturn while undertaking internal restructuring to improve productivity, enhance processes and revamp itself to adapt and thrive in current market conditions. Without access to financing, local SMEs would also find it hard to expand beyond our borders and heed the call from the government to internationalize and seek opportunities overseas. SME owners whom are not able to meet the banks increasingly stringent credit underwriting criteria for business lending can turn to personal loans from banks instead. Personal loans generally have less red tape compared to business loans as banks will only analyse the director’s personal credit history and conduct and not the company’s financials & cash flow. If the company’s financial reports are deteriorating and cashflow is weak, it might be tough convincing bank’s credit underwriters to approve a business loan application. If the director’s personal credit history is still healthy, banks’ personal loans can be an alternative. Personal loan comparison websites such as moneysmart.sg and singsaver.com.sg can help an individual compare most banks’ personal loan offerings and interest rates with few clicks of the mouse. However, personal loans are recommended only if the company has no other means to qualify for business loans and just require a quick cash injection of a small amount to tide through a short period of cash flow crunch. Some personal loans bear higher interest than business loans and quantum extended are typically much smaller than business loans. If the director of the company approaches too many banks in the same time frame to raise the required amount of financing through personal loans, his/her personal credit score could be adversely impacted, resulting in even lower chances of approval for future business loan applications. MAS has also tightened policies in personal unsecured credit limits limiting individuals’ unsecured personal credit limits across all banks not more than 18 times of monthly income from June 2017 and further decrease to not more than 12 times monthly income from June 2019. High gearing in personal loans might also affect refinancing of your existing personal residential property loans with the MAS TDSR (total debt servicing ratio) policy that mandates an individual’s total personal credit monthly commitments not crossing 60% of monthly income when banks assess property loan applications. In summary, SME business owners should only turn to bank personal loans when facing difficulty with business loans, if they require a relatively small amount of financing over a short period (3 to 6 months) and not looking to apply for any home loan financing or refinancing during this period. For SMEs in high growth industries such as tech development, e-commerce, pharmaceuticals or logistics, equity crowdfunding is another alternative to business loans that can provide that much needed capital to fund expansion plans. In a pure equity deal, the business owners can also minimize personal liability on loans while having access to funding. The downside of course is the dilution of equity in the business. A crowdfunding platform that lists companies seeking to raise equity funding via crowd funding is www.fundedhere.com. For SMEs whom are in more traditional industries and less likely to attract equity investors, another new innovative way to access funding that is gaining traction in Singapore is P2B crowdfunding. These crowdfunding platforms act as aggregators to list suitable companies’ funding requests on their online platform to a group of retail investors to fund the business loan applications. Crowdfunding platforms seek to fund the segment of under served SMEs whom mainstream banks might not be able to finance. As the credit underwriting of some of these crowd funding platforms are less restrictive than the banks, the chances of securing an approval here might be higher. The con is higher costs of financing generally compared to SME loan interest rates as investors demand higher yield of return from the higher risk they undertake in funding applications. Popular crowd funding platforms for debt financing locally includes fundingsocieties.com and moolahsense.com. For SMEs facing rejections from banks on business loan applications, factoring is another tool in the funding tool box. Businesses selling to other companies on credit terms are suitable for factoring. In a factoring arrangement, invoices to business customers that are unpaid can be factored to a financier whom typically can advance cash to you up to 80% of the invoice value. Depending on whether if the factoring is on disclosed or non-notified basis, the financer may or may not collect the payment of invoice directly from your customer when due. After the financier receives the payment from your customer, any interest or fees are deducted from the remaining 20% invoice value not advanced and returned to you. This method of financing works best if your receivable books consist of mainly large corporates, listed companies or statutory boards with long credit terms i.e. more than 30 days. For factoring, the financier is primarily concerned on the credit quality of the invoice they are buying over instead of just solely assessing the borrowing entity’s credit profile. This method of financing is again less stringent on credit underwriting compared to traditional unsecured business loans, if the credit profile of the borrower’s debtor is strong. The drawback is the financing can only come in towards the final stage of the supply chain after goods or services have been sold and pending payment. It is an extremely useful tool to unlock cash sitting in receivable books but would not help the SME which requires long term working capital to be repaid over 3 to 5 years. It cannot be deployed during the initial stage of the supply chain to help company fund inventory and raw materials to be purchased to fulfill a confirmed order. The Singapore government recognizes the importance of SMEs in our economic development, whom make up 99% of all enterprises in Singapore with contribution of almost 50% GDP and employing about 70% of our workforce. There are many grants and financing schemes in place that aim to encourage a vibrant and strong local SME sector. Most of the government assisted financing schemes are administered by Spring Singapore and IE Singapore, which are government affiliated agencies with mission to assist SMEs in their growth. Most of the financing schemes administered has some form of risk sharing between the Government and participating financial institutions. The purpose of these financing schemes with risk co-sharing is to encourage banks to increase credit lending to SMEs especially during an economy slowdown as banks grows cautious with SME lending, traditionally considered to be of higher risk. There are up to 12-15 participating banks in the above schemes. Various banks have different credit criteria and companies can consider engaging a SME loan Singapore consultant to help identify the suitable schemes and facilities to tap on. As specialists in SME financing, a competent consultant can also provide advice on common pitfalls to avoid when preparing the SME loan application as well as tips to improve approval chances. In summary, although statistics and data are pointing to another rough year ahead for Singapore’s economy in 2017, there are still bright spots and silver lining for SMEs to tap into. With the digital revolution in full swing, we must accept the current environment as it is and agilely adapt accordingly instead of futilely insisting that markets should operate the way we think it should be. Business as usual might no longer work in future. Accept the fact that change is a constant and continue to undertake innovative ways to access financing and re-position our business to survive and thrive in the new world order. Pingback: How Does US Fed Rates Hike Affect Singapore SMEs?